The ICONS on ICONS exhibition at the Cobb+Co Museum in Toowoomba features 5 local photographers. 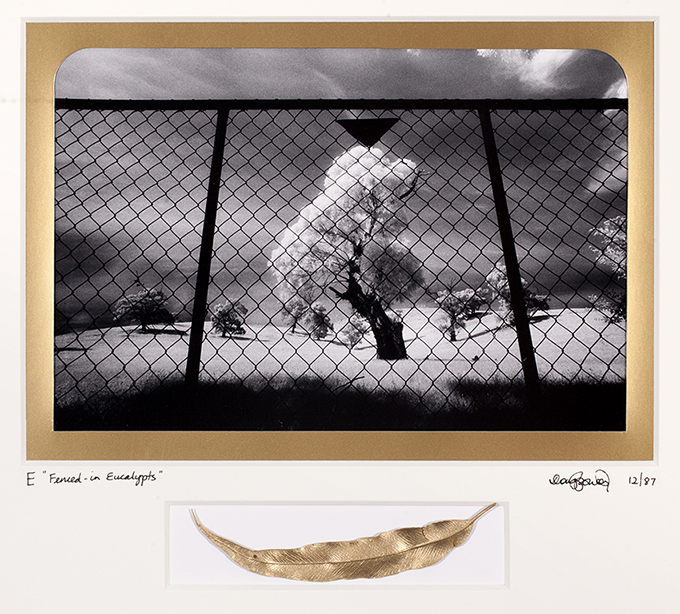 For the show I have selected 26 gelatine silver photographs drawn from my archive. 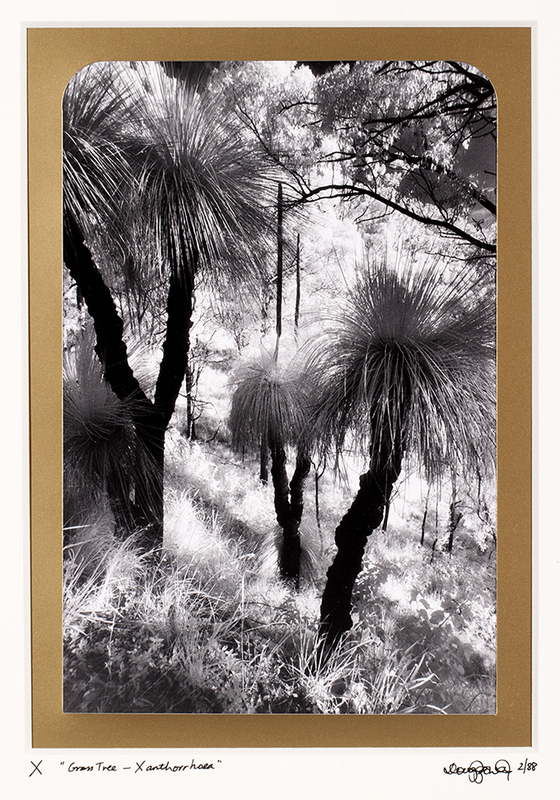 They were originally prepared for the Australian Bi-centennial celebrations in 1988 – 25 years have elapsed and yet the images are as fresh and evocative as ever. 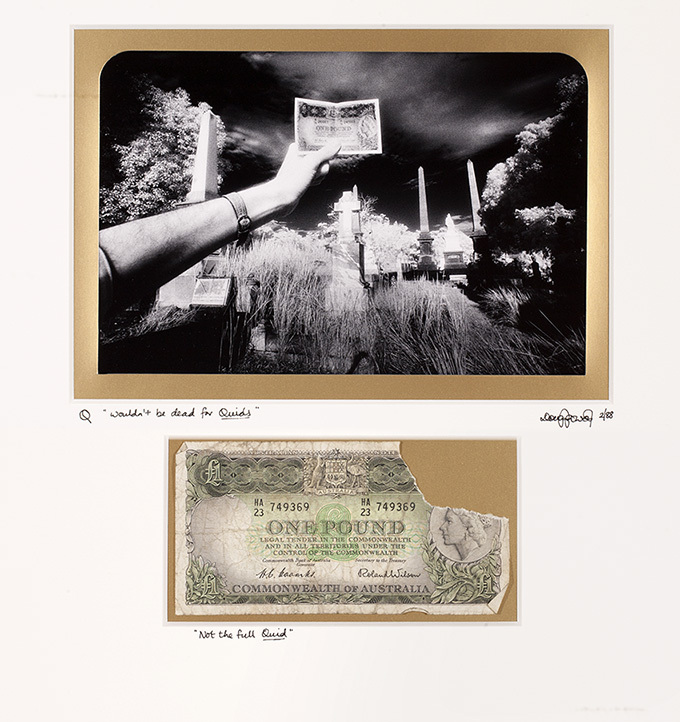 For me the work represents an important aspect of my photographic and photobook work – where the narrative of life and culture is expressed through a set of images and sometimes accompanied by a complimentary text. 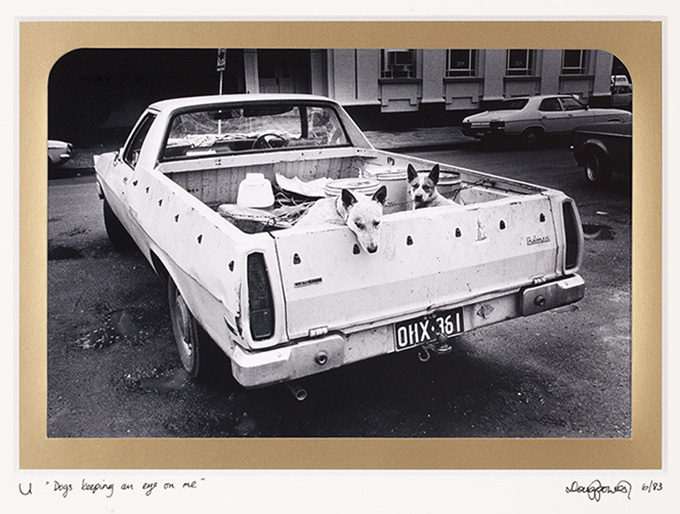 I have had a lifetime interest in the Australian idiom, slang and its stories. 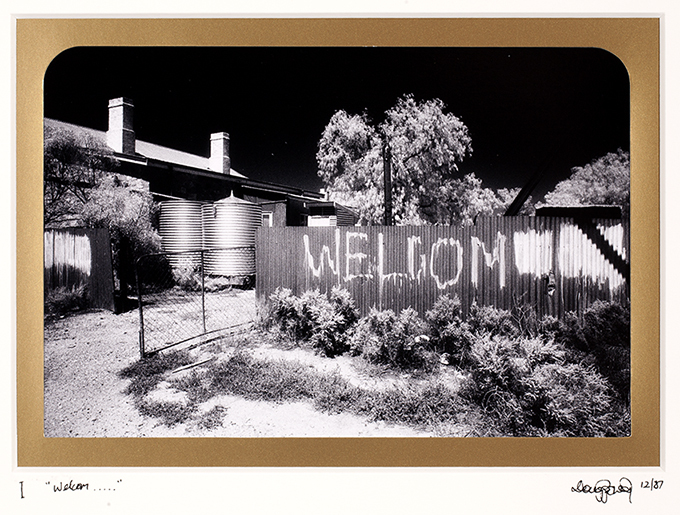 This body of work represents the culmination of a personal investigation into what are seminal identifiers of our culture and the way the Australian condition has shaped our language. In my early teenage years I read most of John O’Grady’s books like They’re a weird mob and Gone Fishin. His dictionary of Australian-isms Aussie English was a particular favourite. At that time I would encounter people, mainly older people, who spoke using the language defined by Sidney J Baker’s or what Afferbeck Lauder called Strine, (a condensation of Australian with an emphasis on the latter part of the word = STRINE). Throughout my life I have travelled around Australia, firstly as a child with my family then later with friends and from the1980s onward as a tour leader on outback safaris. 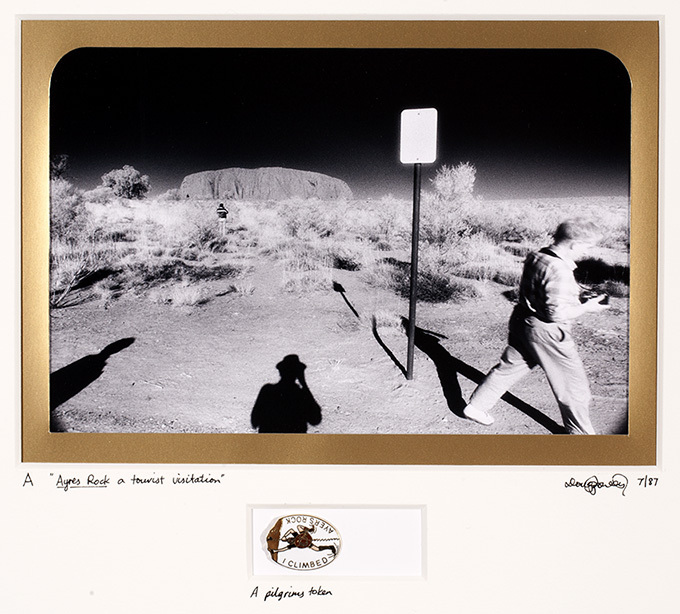 I always felt close to the land and the Australian condition and was fascinated by the stories and the vernacular language by which it was described. I met outback characters including songwriter/performer Ted Egan, before his Northern Territory Governor commission, who immortalised these Australian-isms and stories in song. 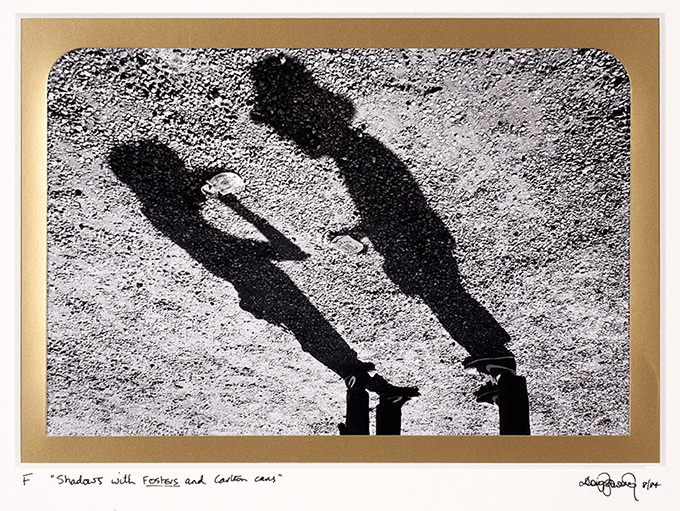 I was also influenced by a library of photographers like Jeff Carter, George Farwell, Douglas Baglin and perhaps even Rennie Ellis who made photographs and told stories in their photobooks. Inspiration also came from Barry Humphreys, Walkabout magazine and the works of painters like Russell Drysdale, Hans Heysen and Sydney Nolan. 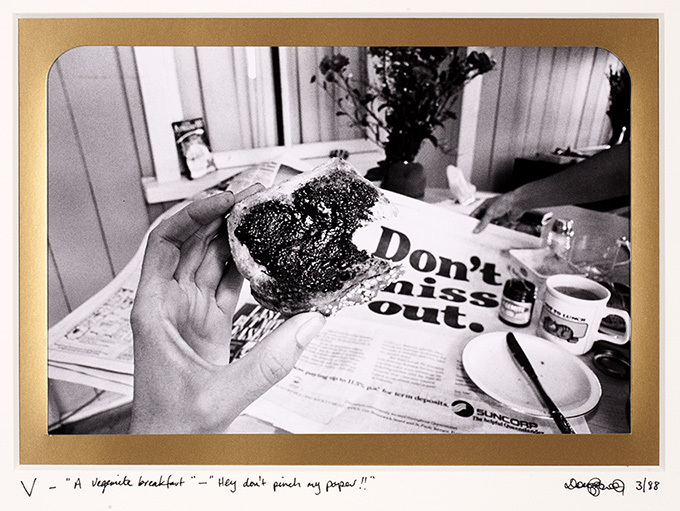 From my experiences I decided to make a selection of things Australian that I considered were so embedded in culture that they could be considered as icons and revered with a religious fervour. I resolved to call the exhibition Icons & Revered Australiana. To provide an extra personal challenge to the project I limited my selection to an A to Z list representing a range of ideas, subjects, myths and localities. 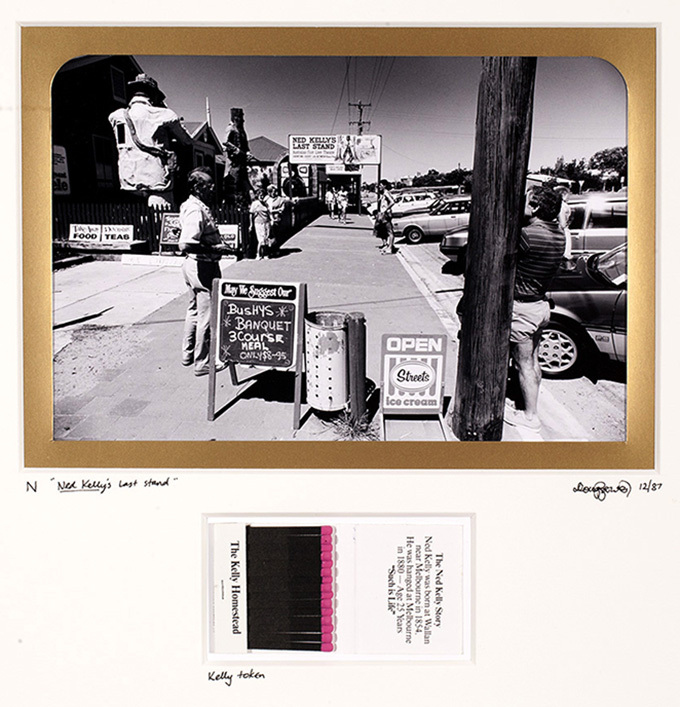 I then embarked upon a 4 state and territory journey to make images. 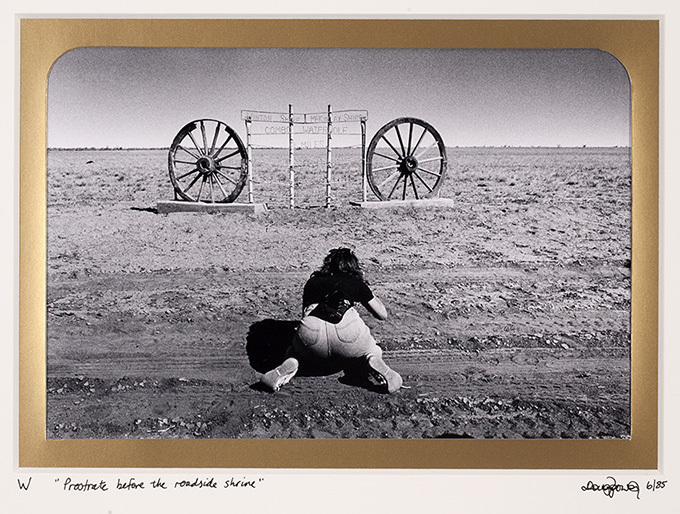 While most images were deliberate and targeted some photographs were made along the way as opportunistic discoveries. I do remember specifically driving into Sydney, putting a wire coat hanger under my arm and walking down to the Sydney Opera House to photograph the bridge. 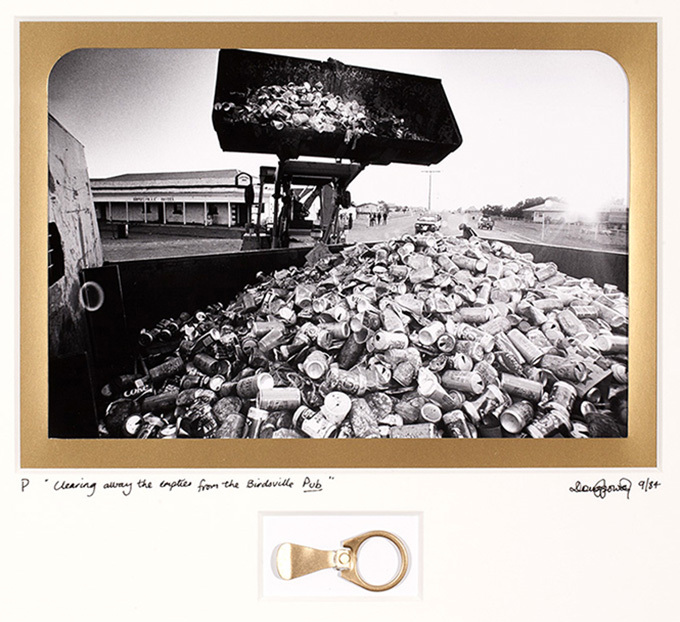 The Icons show was presented at Imagery Gallery in March 1988 and I think, well received. However the Courier Mail critic, a friend of mine of the time, was not impressed – his headline read There’s better work to come! I did ponder the thought that there may have been a sub-plot to his review. 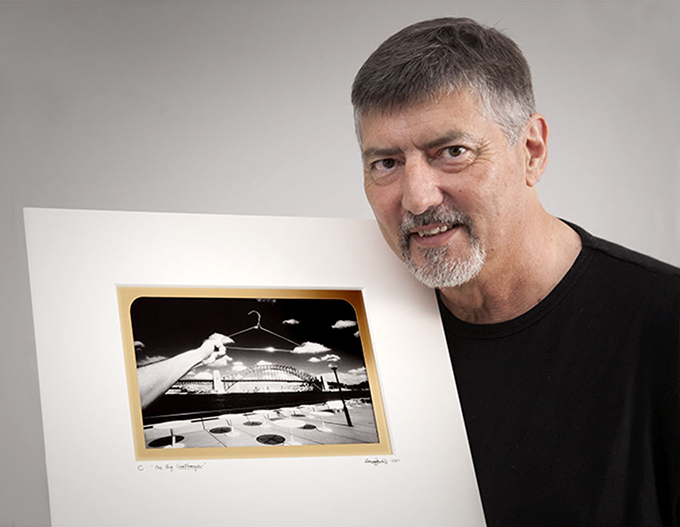 The exhibition went on to show at another venue in Queensland and individual images, such as the BIG Coat Hanger received accolades, was published in many journals, and went on to be one of my signature images. After the show was over the exhibition was de-framed and the mounted images sequestered away in archival solander boxes. But what of this current iteration of the Icons & Revered Australiana body of work? Twenty-five years may have elapsed and yet these pre-digital gelatine silver images are as fresh as ever – a testimony to the special nature of infrared and black+white analogue photography. In revisiting the original catalogue text, I’ve re-connected with the thread of humour, irony and pastiche that has always run through my work. 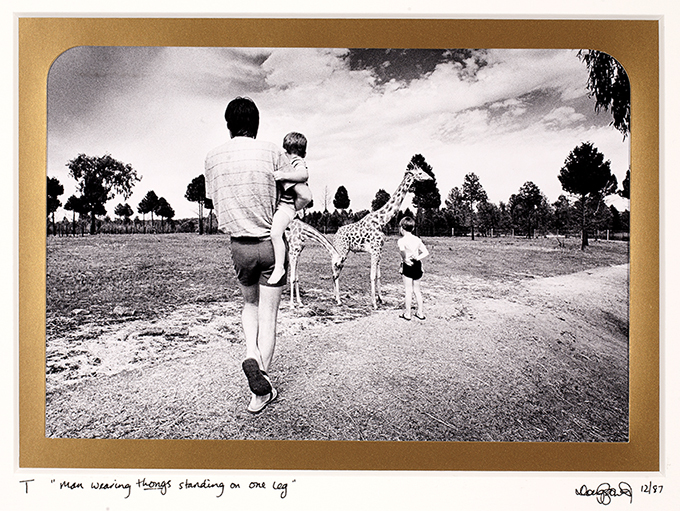 While those who knew these aspects of life, culture and language intimately, and practised it daily, may have long passed on, Icons & Revered Australiana may still resonate with contemporary audiences. I do not expect that everyone will begin to use terms like ‘Bonza’, ‘Sheila’ and ‘Wouldn’t be dead for quids’, although we do encounter this kind of vernacular language in contemporary song writing, (particularly in country and western music), prose and poetry. And for a while we enjoyed it in the wonderfully expressive Strine of Steve Irwin. These Icons and Revered Australiana are just the tip of the great myriad of things Australian. Deep down, within us, is a kind of ‘knowing’ of our Australian-isms, and how they have defined us and continue to define us as a people and a country. A = Ayers Rock – Revered as the largest monolith in the world, Ayers Rock is now known by its traditional Aboriginal name Uluru. B = The Black Stump. It was once believed that the black stump was the limit of possible human habitation beyond which nothing existed but useless land and desert. 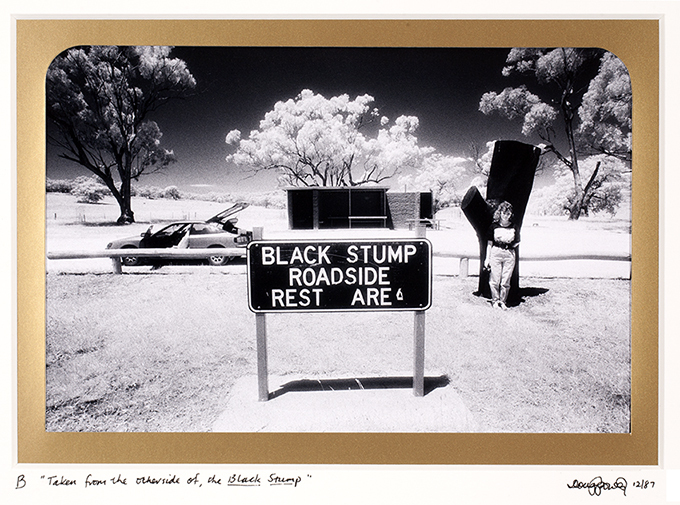 Today, it’s revered by a roadside stop featuring a Black Stump storyboard and black painted stump icon, a car park, BBQ and toilet. And lots of people have come to live on ‘the other side’. Near Coolah, New South Wales. 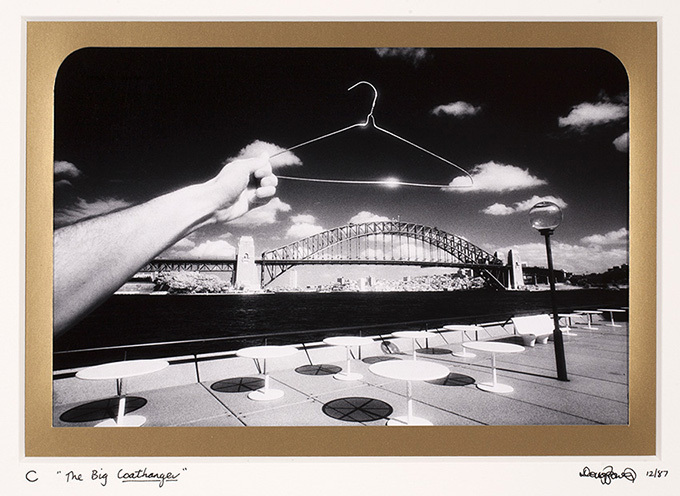 C = The Big Coat Hanger – Slang for the Sydney Harbour Bridge. D = Dunny – The Australian out-house or toilet is affectionately known by this name. A coach camp dunny Birdsville, Queensland. E = Eucalyptus – This is an iconic plant embedded in the Australia psyche; from the arts to the construction of our towns, and the source of therapeutic aromatic oil – a familiar memory in everyday households of Australia. On the Heysen Trail, Mount Lofty Ranges, S.A.
F = Fosters – An historically famous Australian beer. Barry Caves, The Northern Territory. G = Gundagai – Five miles from Gundagai is the location described in the bush verse about a bullocky’s bad luck. While the popular version of this story makes a hero of the bullocky’s dog who ‘sat on’ his tucker box protecting it from harm. However anyone reading the original poem would come to the conclusion that the ultimate in bad luck had befallen the bullocky – that the dog had actually ‘shat in’ the tucker box. 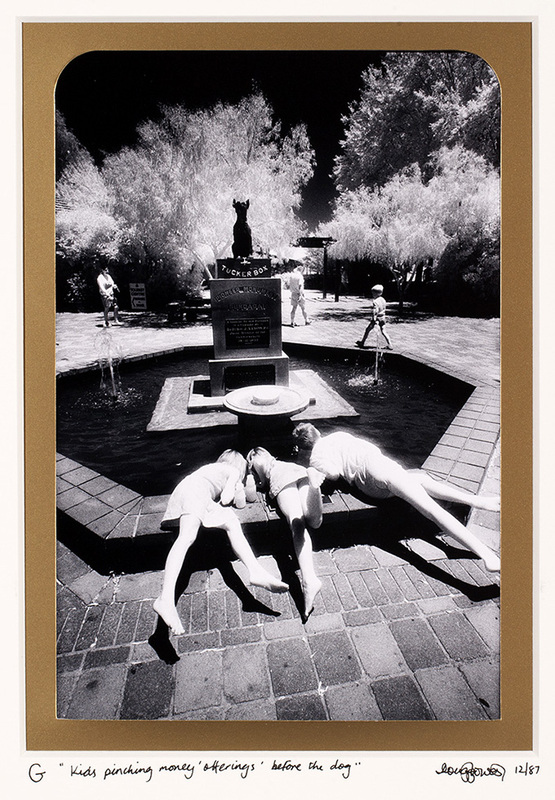 In this image of the tourist memorial near Gundagai a statue of the dog ‘sits’ on the tucker box while kids steal money from the wishing fountain in front. 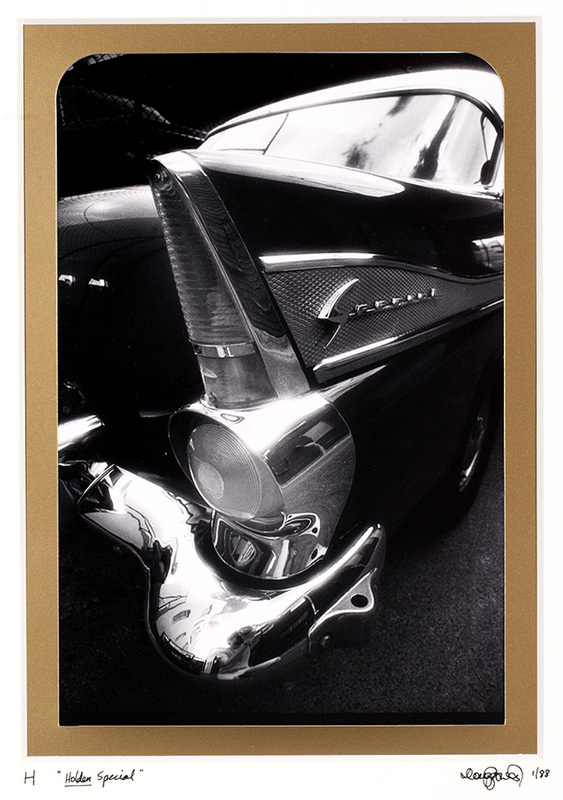 H = Holden – The quintessential Australian motor vehicle. Fish Lane, South Brisbane, Queensland. I = Iron (Corrugated) – The most common and versatile building material for outback structures. 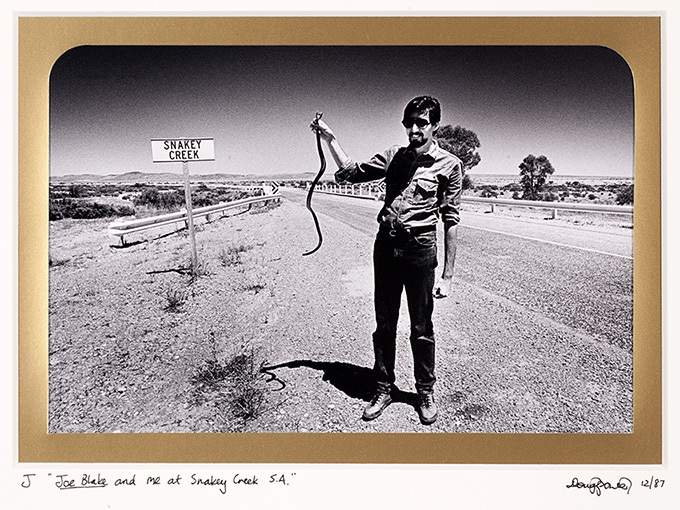 Olary, S. A.
J = Joe Blake – Equals ‘snake’ in Australian rhyming slang. Mannahill, South Australia. 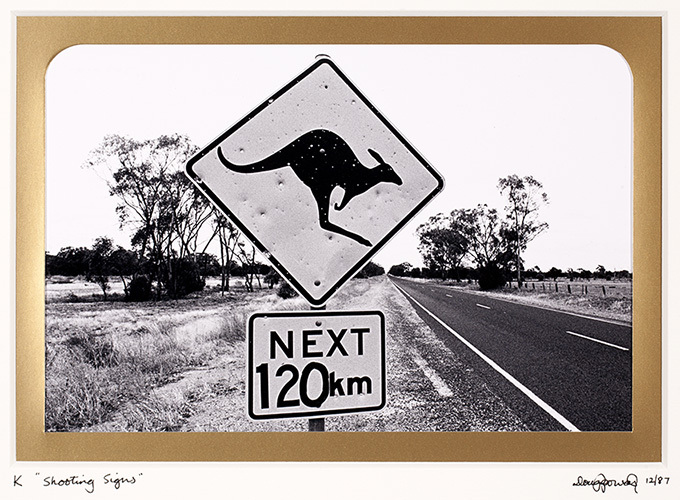 K = Kangaroo – An endemic Australian species often so prolific in number that road signs are erected to warn motorists of their presence. The signs are also useful as a test of shooters skill if a shortage of the real thing exists. Judging by this example the Roos have a fair chance. West of Nyngan, New South Wales. 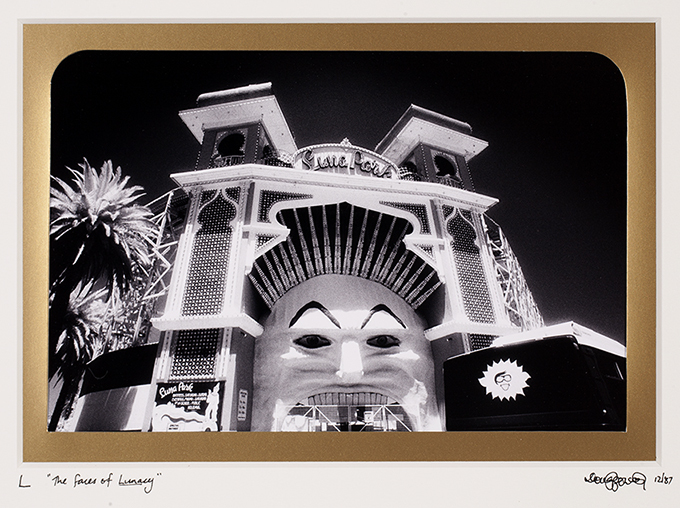 L = Luna Park – A Temple of fun, frivolity and scary rides for Sydney-siders and Melbournites. St Kilda, Melbourne, Victoria. 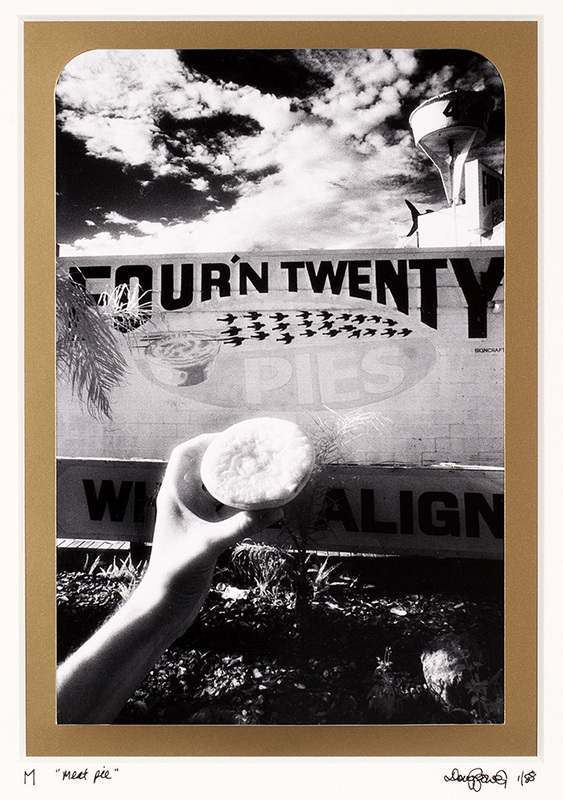 M = Meat Pie – The eating of a meat pie and tomato sauce is a celebrated Australian rite or sacrament, and if you come from Victoria the Four’n Twenty variety would have once been considered the best! Broadbeach, Queensland. 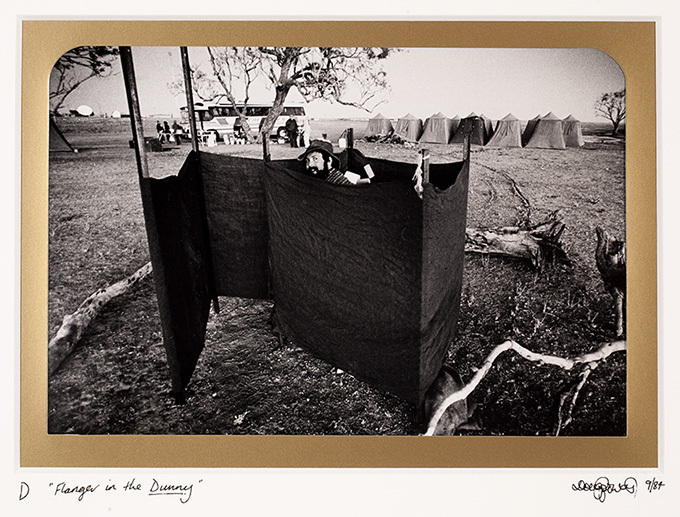 N = Ned Kelly – Located at Glenrowan this colonial sacred site is the place where the Australian folk hero Ned Kelly made his notorious last stand against the Victorian Police. Erected to enable ‘pilgrims’ to ‘revere’ the place, these modern day structures house a multitude of Ned Kelly tokens and souvenirs. Rather than recognise this as a solemn and tragic clash between authority and the underclass, these souvenirs often seem to parody the event. 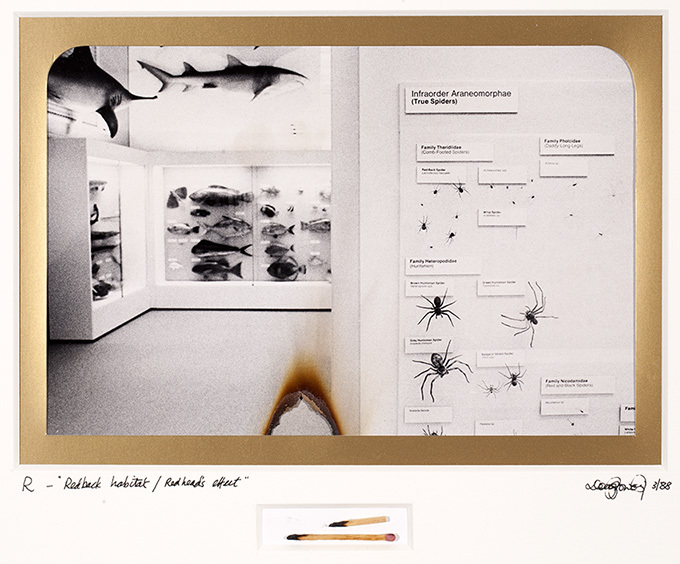 Here, the matches are a strange connection to the fact that the Victorian Police set fire to the Kelly gang’s refuge and burned it down to enable his capture. Glenrowan, Victoria. O = Outback. 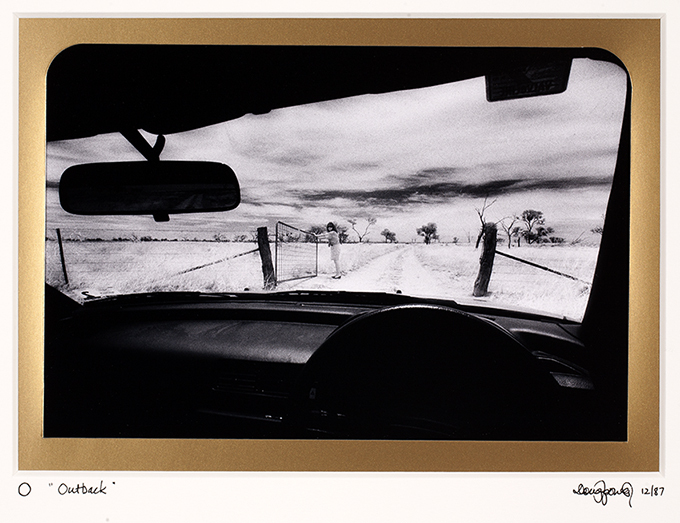 An open gate, and two tyre tracks pointing toward infinity best expresses the great expanse of wide-open space that is the outback. Near Scopes Range Bore Western, New South Wales. P = Pub. Revered as the typical lonely outback pub the Birdsville hotel is so inundated with visitors for the annual races that the traveller’s empty beer cans are removed each morning with a front-end loader and a tip truck. Birdsville, Western Queensland. Q = Quid. The pre-decimalization equivalent of two dollars, often associated with value statements like ‘wouldn’t be dead for quids’ and, ‘not the full quid’. Toowong Cemetery, Brisbane, Queensland. R = Red Heads & Red Backs. Both being red these two Australian items can spell danger. Queensland Museum, Brisbane. S = Sheep. The Australia economy was once described as living off the sheep’s back. 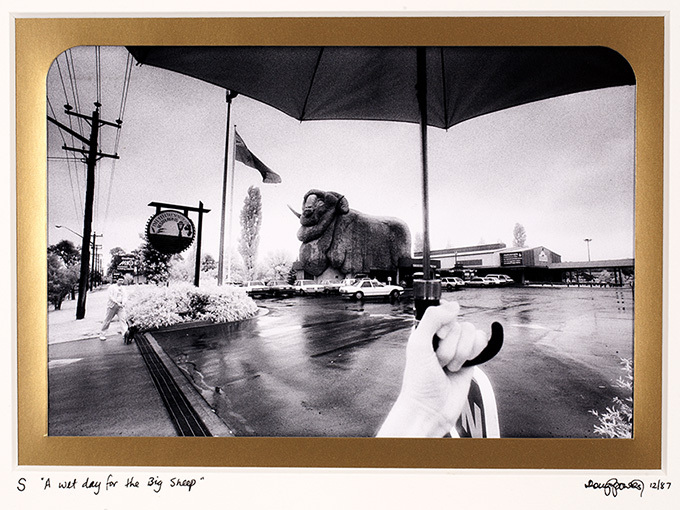 Immortalized here is a giant merino variety attracting pilgrims to its past glory. Goulburn, New South Wales. T = Thong. Casual Australian footwear. Western Pains Zoo, Dubbo, New South Wales. U = Ute. Invented by Australians both in concept and name. Longreach, Queensland. V = Vegemite. A black vegetable extract used as a spread on toast or Salada biscuits. W = Waltzing Matilda. Shown here is a shrine erected by the McKinlay Shire Council to mark the location where Banjo Paterson wrote the Australian anthem about a swagman’s demise on stuffing a jumbuck (sheep) in his tuckerbag. Combo Waterhole near Kynuna, Queensland. X = Xanthorrhoea. The botanical name for the Australian native plant commonly referred to as the grass tree. Near Canungra, Queensland. Y =Yabbie. Any form of the Australian freshwater crayfish of the genus Cherax. 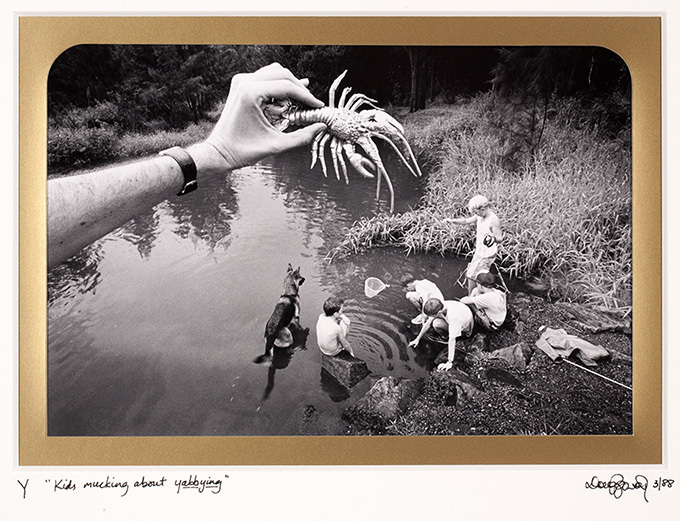 Yabbying or catching yabbies is a favourite pastime of Australian kids. Near Nerang, Queensland. Z = Zack. 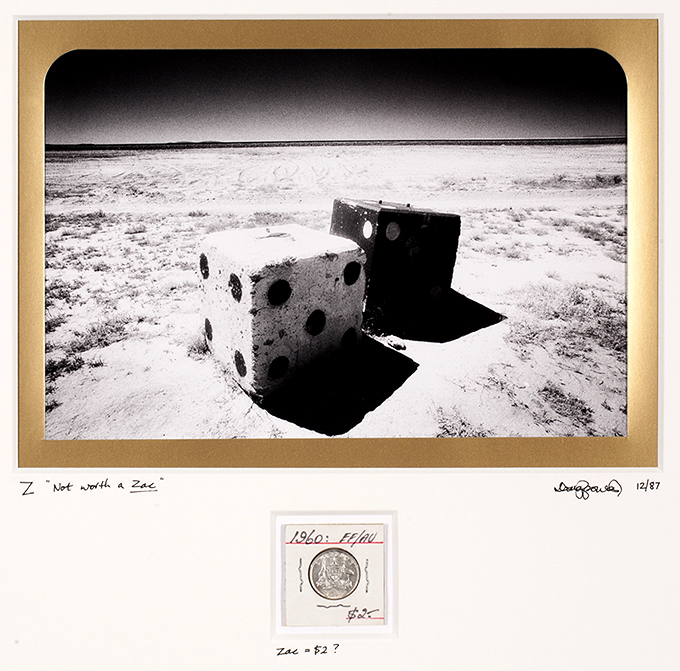 The colloquial term for a pre-decimal coin with a value of 5 cents, usually associated with statements of worthless value, hence ‘not worth a zack’ – pertaining here to barren outback country. Near Yunta, South Australia. Great to see these images again Doug. All of them memorable. Distinctive. Icons all indeed. Somehow that ‘Joe Blake’ looks familiar to me especially as it may be the very one cast in my general direction early one Girraween morning. I could well have ‘sat’ on a tucker box that day as well. I now always take a spare pair of strides when camping. Hardy – The snake is a fake…..